The thing that sets this shield apart from most others is the whole comfort thing. It really is one of the most comfortable shields we've ever offered. There is a foam-covered fiberglass grip on the back of the shield, embedded into the foam so that it's flush with the back surface. The shield is very thick -- well over an inch of padding, so the energy from most blows is absorbed neatly. 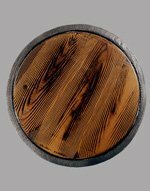 The thick latex coating over the shield is quite rugged and doesn't show signs of strikes even after extended periods of intense battling. This foam shield is perfect for just about any type of character -- Paladin, warrior, soldier, mercenary, glassblower -- you name it. It's also particularly good for sparring and shield training (which we do a lot of at the Strongblade warehouse). The shields are colorful and perfect for Live Action Role Playing, cosplay, Halloween, theatrical use or sparring training (as I think I mentioned two sentences ago). Our LARP Black & Red Round Shield is from our Ready for Battle line. The Ready for battle line is a less expensive line, that is still durable and made of quality foam, but is not as detailed as our other lines, making them very affordable and great for beginners or those on a small budget. 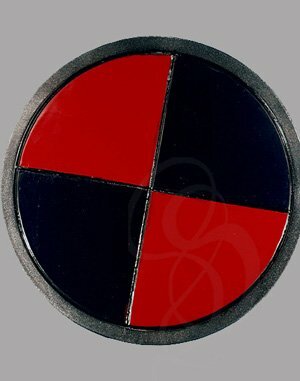 This shield features a classic heraldic design with two contrasting colors - red and black. With the simple design, it can be used for just about any character or theme. 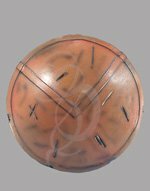 This round shield has two leather arm straps on the back and can be used with your left or right arm.